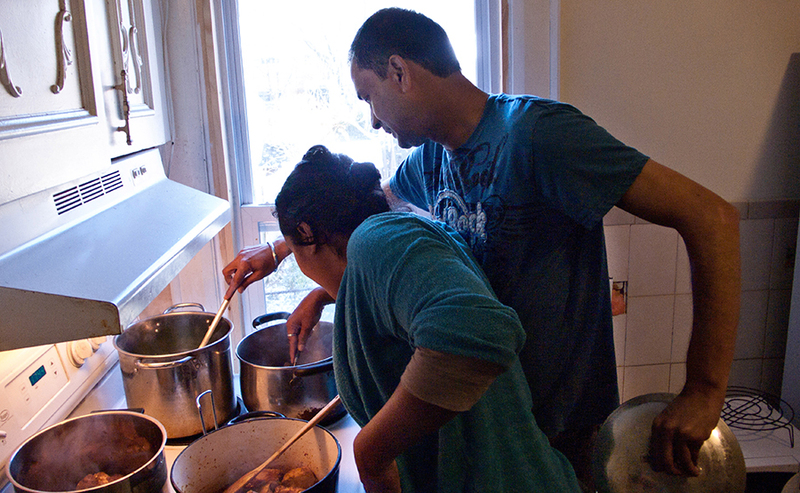 Sara, my pumpkin pie partner, cooks with Azeem on Sundays so they will have good food in their house during the busy work week. One Sunday I cooked with them, so at my house we also had a delicious week. Chicken Haleem is absolute comfort food – a satisfying and spicy one-dish dinner made with grains, various lentils and chicken. The perfect meal on cold winter evenings, its tasty heat lingers in your mouth and warms your core. Barley, wheat berries and lentils (split yellow peas, split mung, skinless urd and orange dal) are covered in water to soak for an hour or two. Or not. We just dumped them in after about twenty minutes. Chicken thighs are coated in a masala which includes red chili, paprika, turmeric, black pepper, curry leaf, coriander, nigella seed, cumin, green cardamom, bay leaves, black cumin, clove, ginger and mustard seed. 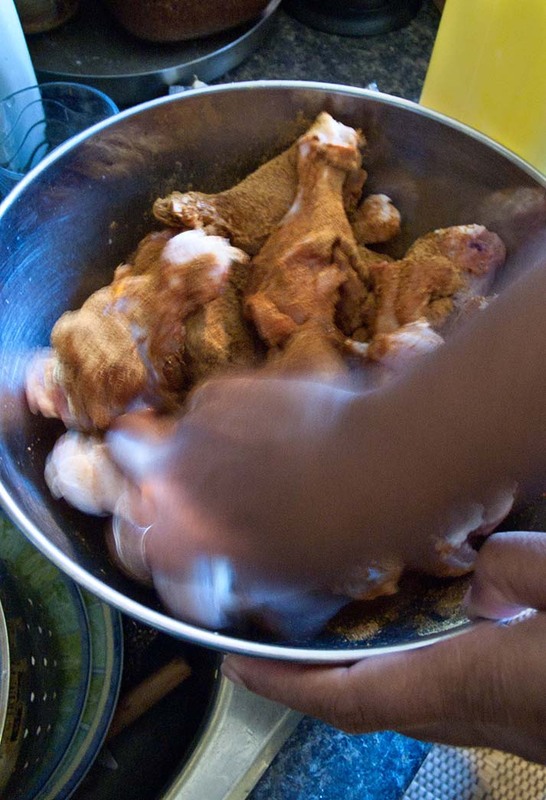 Fry the spice-coated chicken for a few minutes. 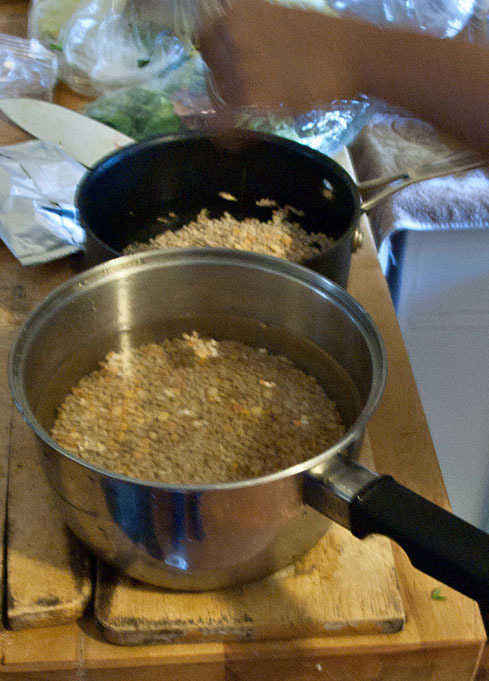 Then add the soaked grains and lentils and water to cover by an inch or so. 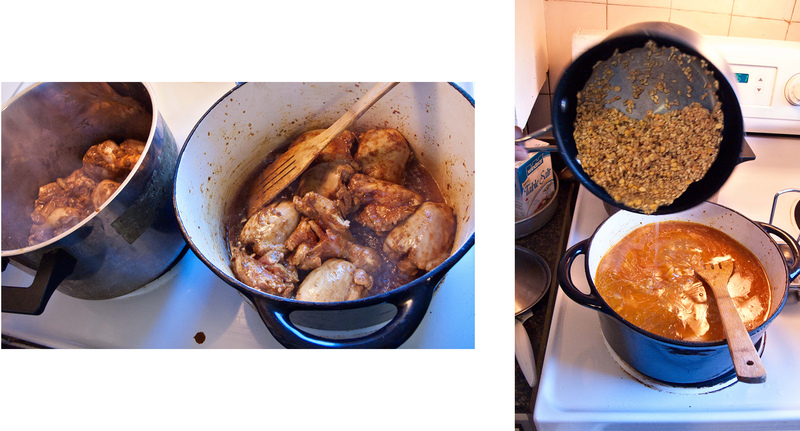 That’s about the end of the work – it simmers for 6 hours. 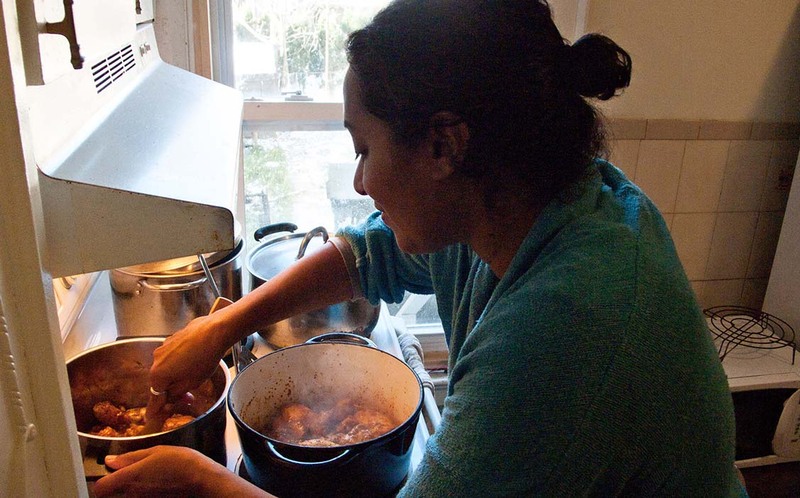 When the haleem is done, remove the bones and mash it. Garnish with chopped green chilies, fried onions, fresh coriander leaves, grated ginger and lime juice. Eat with a paratha (flatbread). Best of all, if you don’t have or want to shop for all these individual ingredients, there is a package mix which contains all the lentils and grains and the spice masala. Too easy! Sara says Haleem with beef is even tastier. 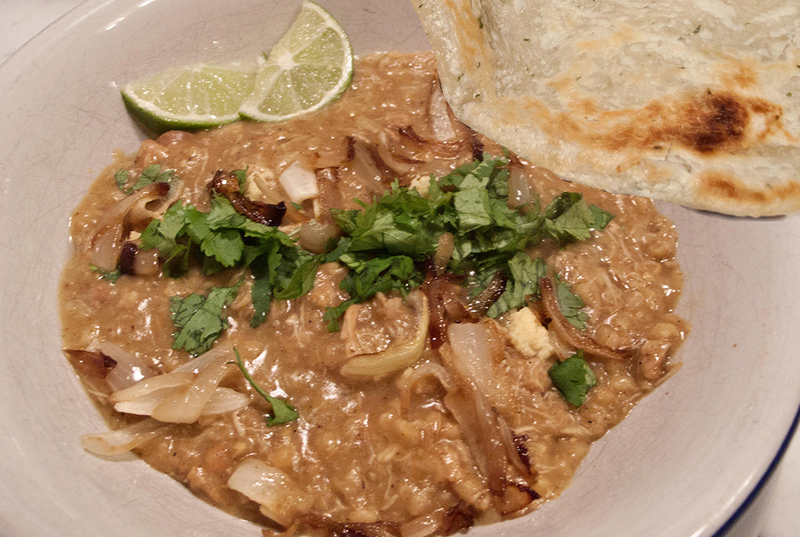 Although hard to believe anything could be better than the Chicken Haleem we made, we might try that next time. 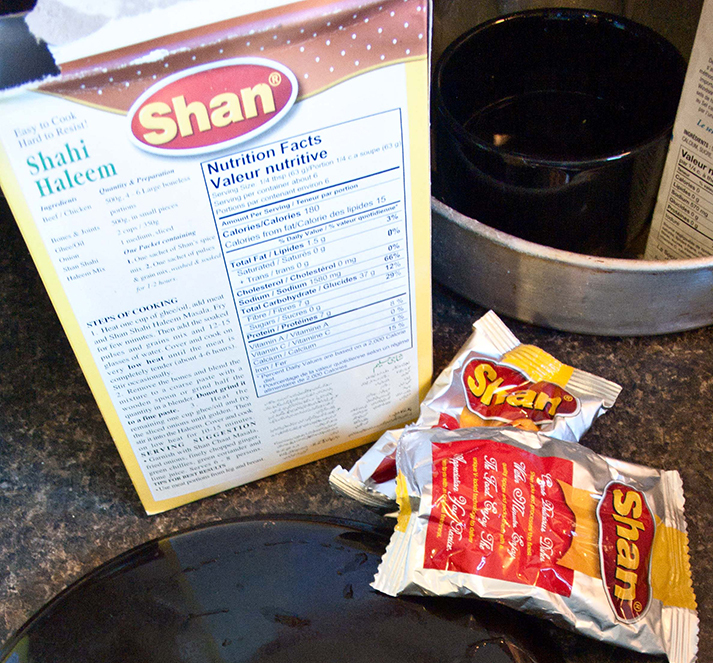 If making Chicken Haleem sounds delicious but too complicated, buy the box and you will have a delicious dinner needing no other ingredients than the chicken and fresh garnishes. 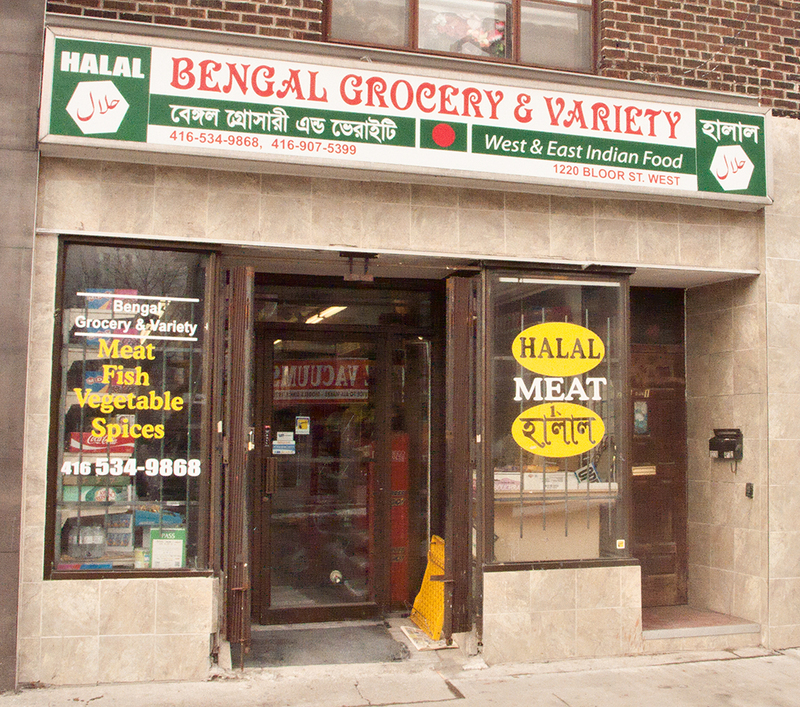 I was so happy to find this tiny storefront where I can replenish my supply. “May I help you?” The proprietor’s question was gracious but slightly skeptical, as if he thought that since I am obviously not Asian, I must be wandering his fragrant aisles by mistake. 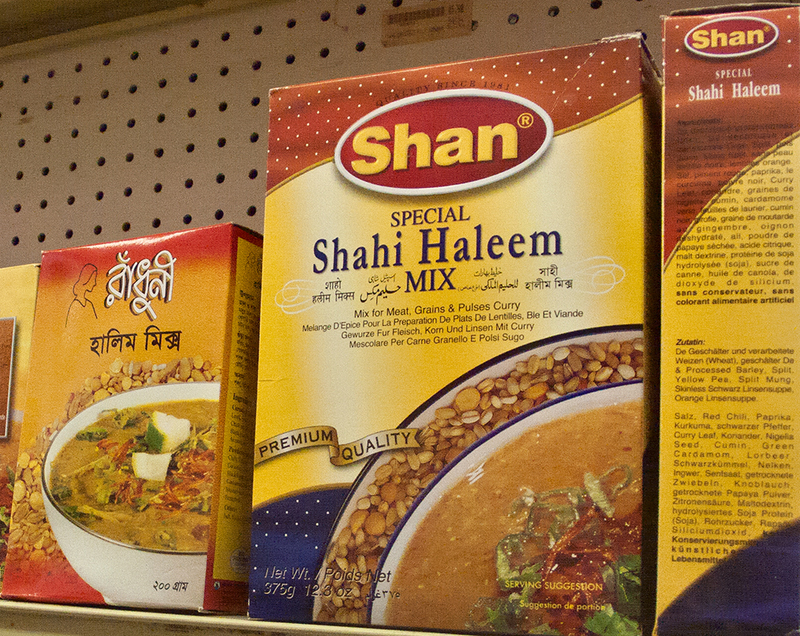 “Found it, thanks.” He looked surprised when I plunked down five boxes of Special Shahi Haleem mix beside the cash register.